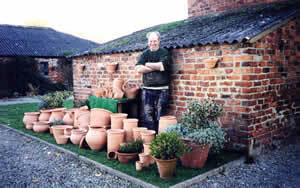 The current proprietor of the Littlethorpe Potteries is Roly Curtis (pictured above). Roly has been running the potteries since 1975 and is carrying on the family tradition of making traditional pottery. During this time the Curtis Pottery Mark has become synonymous with the very best in traditional pottery making. 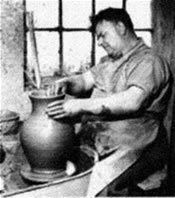 George Curtis who started working at Littlethorpe Potteries as a bench boy around 1912 and who subsequently married the then owner's daughter in 1932, managed the potteries before inheriting the works with his wife in 1939. After the introduction of plastic pots George was regarded as the last of the big ware throwers and his reputation was such that he was the subject of the BBC documentary ‘Big Ware’. This documentary was shown on the BBC programme ‘Omnibus’ several times and clearly showed George’s wide range of skills. George was equally adept at making large 60 lb garden planters and vast numbers of small plant pots at a tremendous speed (Ten 3" plant pots per minute). This variety of skill undoubtedly played a large role in enabling George to keep the pottery open through difficult times. George Curtis continued to run the works until handing over to his son Roly, in 1975. Roly Curtis, who has lived at the potteries all of his life and is pictured left as a young boy (aged 8) learning his trade. Due to the lack of demand for traditional terracotta pots, brought about by the introduction of plastic pots in the 1970’s. Roly, upon leaving school perused a career as an industrial chemist. However, with George’s impending retirement, Roly enthusiastically returned to the Pottery taking over the running of the site from his father in 1975. Roly subsequently developed and expanded the range, reintroducing many of the designs previously made by the pottery in the 19th Century. These include forcing jars, box pots, bread crocks and the Littlethorpe Long Tom. Appreciating the rich heritage of the site, Roly undertook a programme of preservation, restoring the original Newcastle coal fired kiln, clay purification machinery and tile pressing equipment some of which are currently all on display at the potteries. Roly’s son Mark is continuing production into a 4th generation. The art of pottery making, takes many years to perfect. Roly has been working at the potters wheel for over 50 years and claims to still learn something new about pot making every day.